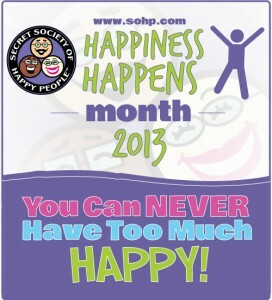 Due to the diligence of the “Secret Society of Happy People” ~ and it really does exist, I looked them up here http://sohp.com/ ~ since 2000 August has been designated at Happiness Happens Month!! Do you know negative people? Are you up against cynicism? Feeling blue? Here are 3 simple ways to counter that! Share a Smile! Instead of avoiding eye contact with others, keep your head up and smile at strangers you pass by. While it may take some getting used to (on your part and theirs!) you’ll soon find that you are feeling happier and they may as well! Reach Out! Do you know someone who needs a pick-me-up? Someone just got bad news? Offer a cup of coffee (and a hug if that works for you!!). A small gesture of friendship can make a huge difference in someone’s day. Say “Thank You”! Even for the small stuff…and mean it! Drive through coffee? Thank the person who hands it to you. Groceries bagged? Thank the bagger. They may be just doing their job but it’s nice to be noticed and appreciated!